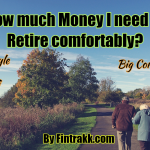 How Much Money Do You Need For Your Retirement? Swati Arora on 5 Best Stock Market Trading Apps in India: Beginner’s list! Shruti Mishra on Best Courses after 12th: Creative Career options to look for!